The implementation of green roofs on the top of buildings is becoming a trend in urban cities as they provide numerous benefits for green development growth. In Malaysia, numerous approaches towards sustainable development have been adopted in order to overcome crucial environmental issues such as urban heat islands, air pollution and lack of green spaces. One of the sustainable approaches that helps to minimize such problems is the use of vegetation or plant material on rooftops, also known as green roofs. Among the benefits of implementing green roofs or buildings are reducing heat flux, optimizing energy efficiency, and improving storm water management. Despite the benefits of green roof installation, the maintenance consideration is still largely unexplored and is a significant factor in the viability of green roof installation. Therefore, this paper aims to identify the significant criteria for green roof maintenance practice in Malaysia, as an added value to the existing practice that has previously been more concerned with design and benefit considerations. The literature findings reveal that there are generally 20 criteria related to such maintenance. Out of these, six are identified as the most significant factors in the best practice of green roof maintenance, being appropriate and important for the Malaysian tropical climate. The findings can serve as added value to existing practice, which has previously been more concerned with design and benefit. Therefore, they will also help to improve current green roof maintenance undertaken by building operators and maintenance managers. Malaysia is a tropical country located on the South China Sea, lying at latitude 3.12 °N and longitude 101.55 °E (Mirrahimi et al., 2016). The tropical region is an uncomfortable climate zone that experiences a large amount of solar radiation, high temperatures, high levels of relative humidity, and long periods of sunny days all year round (Al-obaidi et al., 2014). This is also supported by Khalil & Husin (2009), who describe the location of Malaysia as a tropical climate region, which is naturally hot and humid. Moreover, due to the rapid growth of the urban population, this region has experienced a rise in urbanization, especially in developed countries such as Singapore, Malaysia and Indonesia (Al-obaidi et al., 2014). The boom in the urban population has led to mass development and has reduced the number of green areas. In 2012, a study by Yusof and Johari (cited in Chow & Abu Bakar, 2016) stated that the green areas of Kuala Lumpur had been reduced from their original 24,222 hectares in the city area to 14,386 hectares (59.4% of the total). This rapid development has also boosted the intensity of urban heat islands (UHIs) (Wong & Yuen, 2011). All of these risks are emerging as sustainability challenges that must be addressed by urban governments, so climate mitigation and adaptation efforts are intrinsic aspects of long-term city planning (Hidayatno et al., 2015). Nevertheless, the construction industry in Malaysia has been developing concurrently with sustainable development and is working to end the problems which have occurred in recent decades. One of the sustainable approaches to help minimize environmental problems is the use of of vegetation or plant material on rooftops, also known as green roofs. Many buildings in developed countries such as Germany, Canada, Japan, America and Singapore have used green roofs as a solution to reduce environmental problems and provide benefits. As stated by Herman (2003), about 14% of all flat roofs in Germany have adapted the green approach and the supportive government policies have made it typical to have green roofs in cities. At the same time, over the past few decades, green roofs have become well accepted and more popular across Europe (Kamarulzaman et al., 2014). Furthermore, Getter & Rowe (2006) also mention that the roof area in most urban regions would usually constitute around 21%-26% of the total area. Therefore, such roofing would provide the possibility to add to the urban green area. The technology is also becoming common in the USA, for instance in Chicago, Portland, Atlanta and other cities (Ismail et al., 2016). Meanwhile in Canada, the Canadian government began incorporating green roofs in a series of sustainable initiatives, making them eligible for partial reimbursement and funding (Snodgrass & McIntyre, 2010). Moreover, the Ministry of Federal Territories and Urban Wellbeing Malaysia through “The Greening of Greater KL” program, have targeted a total area of conventional roofing of 150,000 m2 to be converted into green roofs by 2020 (Getter & Rowe, 2006). That was a very great initiative by the Government to help promote the implementation of green roofs in the country, even though the program is still at the preliminary stage. Although the application of green roofs in the country is still low, there have been some successful green roofs applications applied to a few buildings in Malaysia, and it is slowly becoming a trend in the building industry. Regardless of the green roof implementation on certain buildings that has taken place, challenges in terms of maintenance should also be taken into account and given attention. 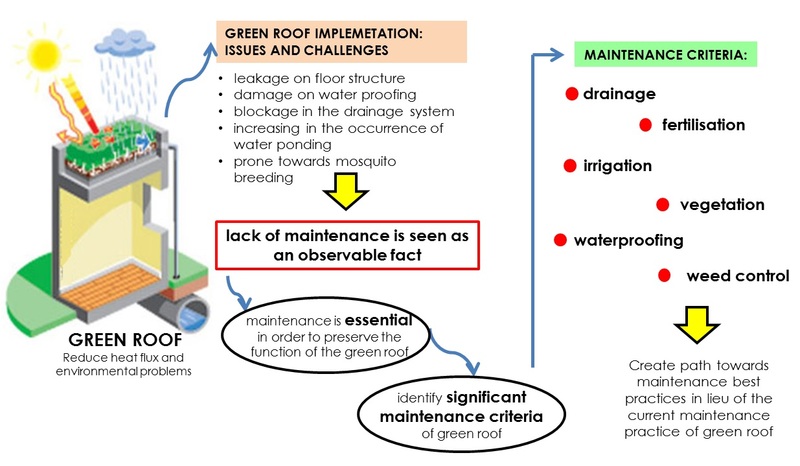 There have been cases where the main problems in green roofs have been technical issues, such as damage to water proofing; leakage onto the floor structure at green roof level; and blockage in the drainage system, increasing the occurrence of water ponding, as well as mosquito breeding (Ismail et al., 2010). Thus, the lack of maintenance is seen to be observable fact that can result in roof gardens not functioning as intended (Ismail et al., 2010). The establishment of plant material on rooftops provides numerous benefits to people and nature. When considering the viability of the installation of green roofs, the maintenance process is a highly important factor, and is believed to be one of the major obstacles to their installation. Therefore, the aim of this paper is to identify the significant criteria for green roof maintenance practice in Malaysia. The objective of the research is to establish current practices and the vital criteria needed for green roof maintenance. Hence, the findings of the paper are presented to achieve the research objective. Moreover, the findings can serve as added value to existing practice, which has previously been more concerned with design and benefit consideration. In order to achieve this aim, previous studies on types of green roof, and their relation to the significance of maintenance and maintenance criteria, have been explored in both local and international contexts. The green movement has become a global trend in the construction industry, as numerous studies on the concept of green roofs have exemplified. However, in Malaysia concern for green roof maintenance has not been prioritized in terms of the viability of its application. The maintenance of the green roof system itself is often neglected, but maintenance plays an important role in sustaining the green roofs for their intended function. The outcome of this study has focused on the green roof concept in assessing the appropriate maintenance criteria to be applied in Malaysia. These are considered to be appropriate and significant in the context of green roof maintenance in Malaysia. Inevitably, the maintenance criteria should be well acknowledged by the building owner and operators before the green roof is implemented. A future study path will outline the strategic ways and best practices as an improvementt for the current maintenance practice of green roof. The authors wish to acknowledge the support of grant in performing this study under the Special Grant Incentive for Supervision in Perak (GKIPP) Phase 1/2018 funded by the Offfice of Research, Industrial Linkage, Community and Alumni (PJIMA), Universiti Teknologi MARA, Perak Branch, Malaysia.